When we shared our friday pooja & Hridaya kamalam kolams, a reader asked me to share our friday pooja procedures in detail.So in this post,i have shared my wife’s method of doing Lakshmi pooja on Friday.I won’t say this is the authentic method.But my mom & my wife has been following this procedure for more than 40 years in our house each Friday.Now my daughter-in-law is also performing the same.In this post,i have written how to make Lakshmi poojai with Thiruvilakku poojai kolam,Hridayakamalam kolam and thiruvilakku pooja stotram/slokas along with 108 potri in tamil. 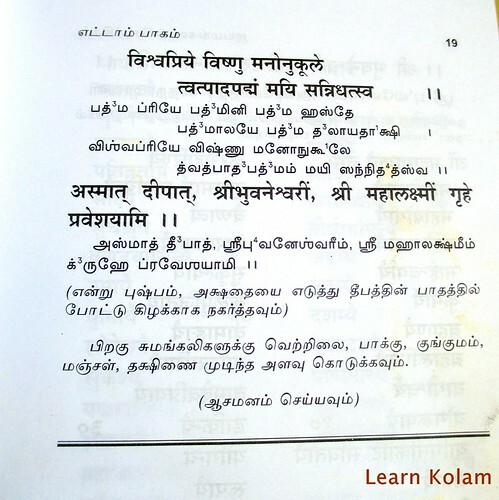 i.e Archanai slokam in Tamil.I have tried my best to explain the pooja procedures.Hope u will find it helpful.I have attached all the sloka pictures from our book “ Jayamangala sthothram”. 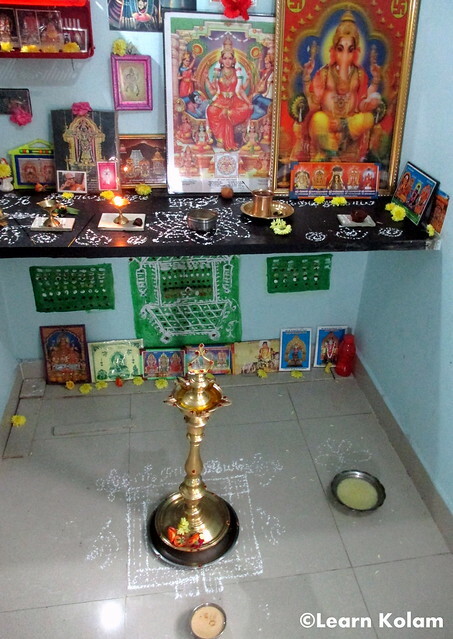 I have also typed the Shodasha upachara pooja sthothram in Tamil & English. If u want to use this pictures in your website,please ask our permission.Thanks for understanding.Please leave a comment here if its helpful for you.We will be more happy to know it .Also leave your suggestions and share your method of doing this pooja.It will be helpful for everyone.Ok, let us see the significance of doing this pooja in our house. Mahalaxmi Thiruvilakku Pooja is a special one and people can get various types of benefits if they do it in Tamil months from chithirai to panguni. Chithirai : Blessed with increased production of Pulses. Vaigasi : Blessed with Money Aani : Blessed with Marriage Aadi : Blessed with Long Life Aavani : Blessed with New Born Children Purataasi : Blessed with more Cows Aipassi : Blessed with Food Karthigai : Blessed with Moksha Margali : Blessed with Good health Thai : Blessed with Victory in life Maasi : Blessed with removal of sins. Panguni : Blessed with Dharma Thiruvillaku Pooja can also be done in Ammavasai and pournami days. ( No moon & full moon days) . 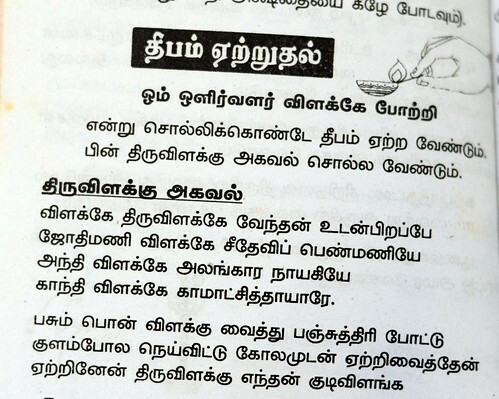 Please refer the picture for the benefits of doing this pooja in each Tamil month. 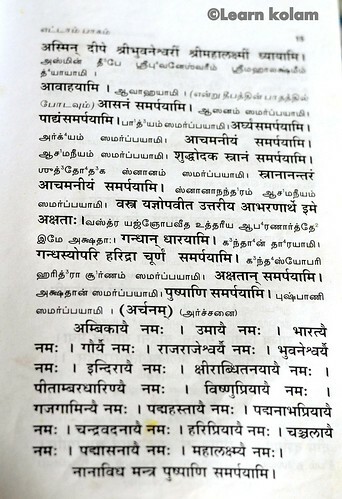 In this pooja,we consider the lamp/thiruvilakku as Goddess Lakshmi.To make this pooja,we should do the following procedure and chant slokas.It takes one hour to chant to finish this pooja.Its better to perform this pooja before 10.30 am in Friday morning ( ie before raahu kaalam).Ok.Lets see how to make this poojai. 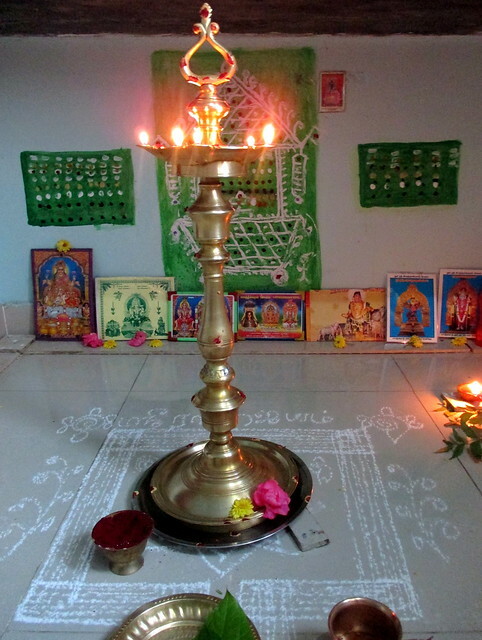 On Thursday night,wash the lamps properly and decorate it by keeping manjal,kumkum.No need to put oil & thread in it. 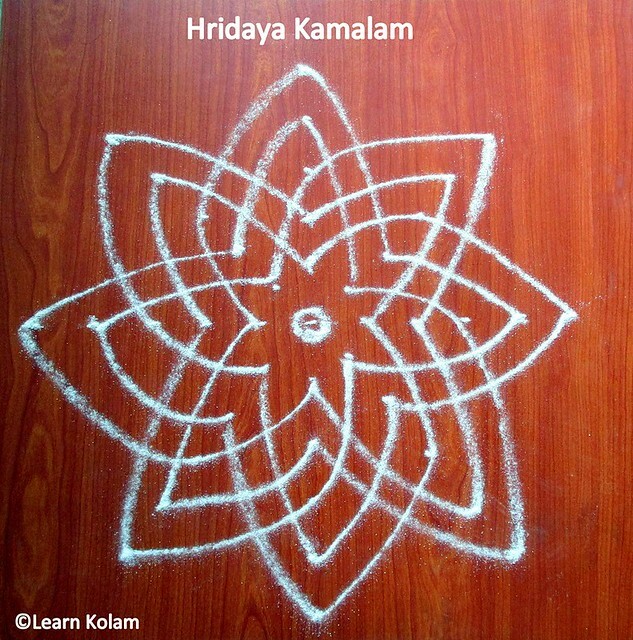 The next day morning,ie on Friday,draw some Padi kolam in your house entrance and draw the above kolam with hridaya kamalam in the center in front of your pooja room. Put the thread and oil the lamp.Do not light it now.Just keep it ready.Keep the flowers for all the idols. Prepare the neivedyam.U can make any payasam,kesari or sweet pongal for prasadam. 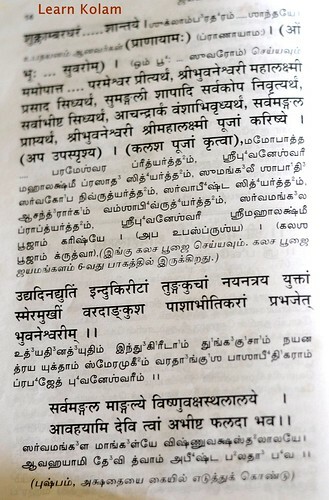 In a plate,keep the thambulam items(Vetrilai,Paaku,2 Banana,Coconut).Keep turmeric powder,Kumkum,Akshathai(Raw Rice mixed with turmeric powder) and 108 Uthiri poo( flowers) ready. 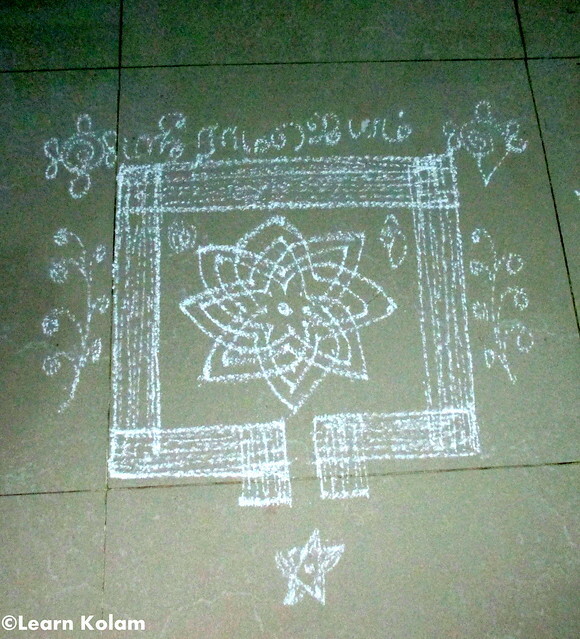 Now keep a plate or Manai( Peedam) over the kolam and place the lamp with five faces. Keep the neivedyam prasadam and thamboolam plate along with Dhoop/Incence stick and camphor in a plate.Keep theertham(water) in the pancha paathram with utharini in front of the lamp and now light the lamp.Light all the five faces of lamp as shown in the picture below. First light the incence stick and do the aradhana.Now sit in front of the lamp and start chanting the slokas.Start with Ganesha stotram and proceed with slokas given the below pictures.Read all the slokas given below by following the directions. 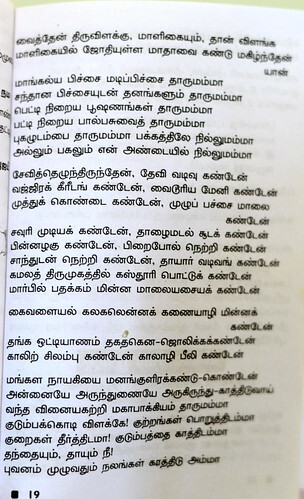 Its about imvocating Goddess/ Aavaahanam seithal. 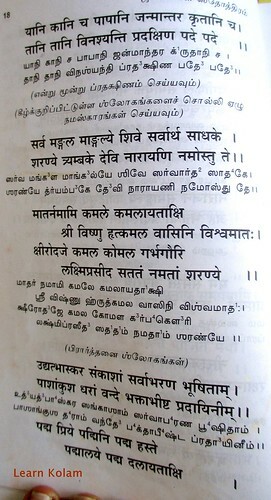 Chant upto “ Nanavidha mantra pushpani samrpayami”. 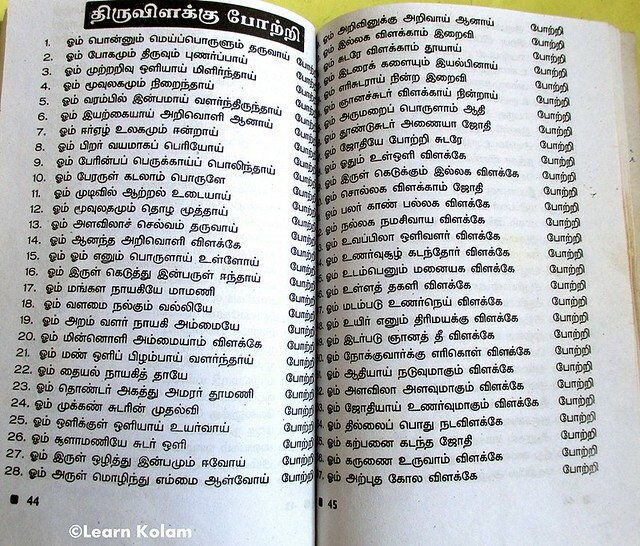 Aftre invocating God, do the vilakku archanai by reading the below stotram.Chant these 108 lines by flowers in the feet of lamp.U should put 108 petals of flowers or jasmine flowers leaf would do.You can also do kumkum archanai if u don’t get flowers. 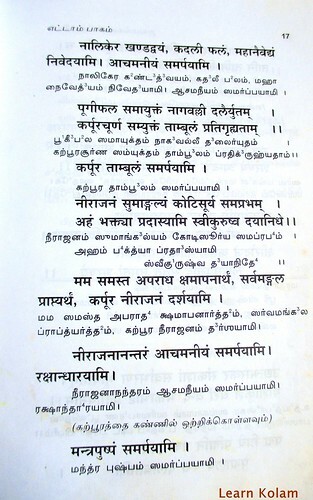 After finishing the archanai show the dhoopam, dheepam, karpooram and do pradhakshinam & namaskaram as stated in the picture. 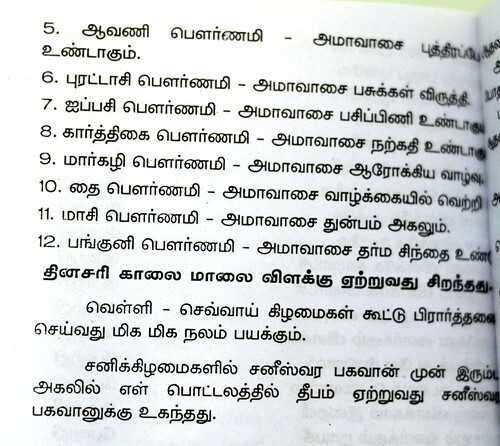 If the image is not clear, please refer the mantra I have shared below.U can give thaamboolam for Sumangalis/married women and finish the pooja.It takes one hour to chant these slokas and finish the pooja.Its better to perform this pooja before 10.30 am in Friday morning. Move the lamp slightly towards the east after doing the pooja. 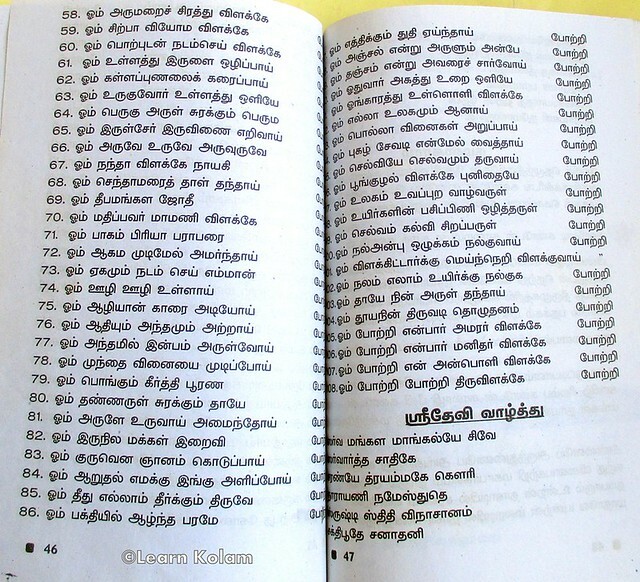 Now you can distribute the thamboolam to your friends & relatives if you have invited any married ladies to your house. 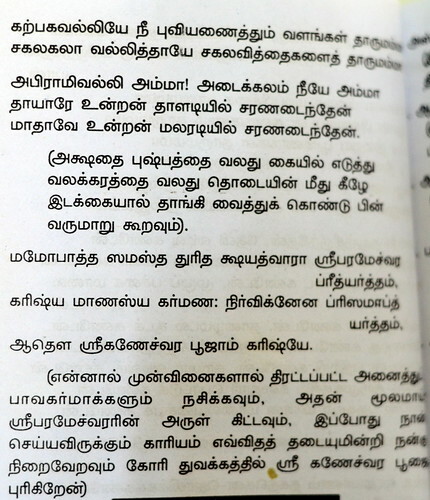 Please refer the pictures I have shared from the book form more clarifications. 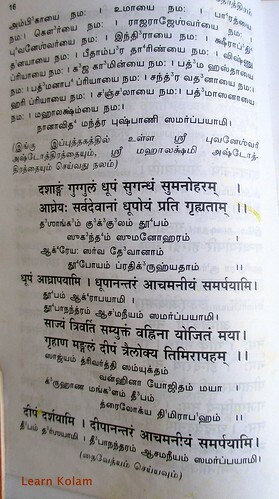 Last but not the least,if u are not able to perform this pooja in the morning hours,u can light the lamp in the evening around 5.45 pm and sing the song given in the below picture.Some people follow this method too.But u should keep neivedyam,thaamboolam as stated above and do this pooja.Finish it with mangala harathi. Could you please post a English version of the stotras? Or send it to my e-mail? -Maya. Very nice blog.Nice information.The very name Maha Lakshmi signifies wealth, prosperity and material pleasures. 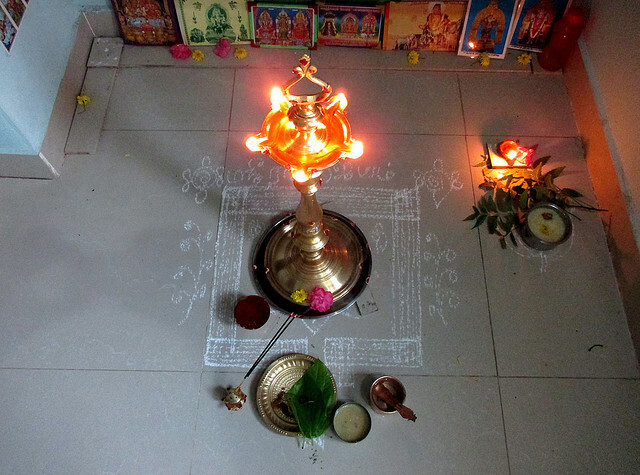 A ritual in her name brings all these assets into our homes and uplifts life to a great extent. Vaibhava Lakshmi is one of the manifestations of the goddess who has eight aspects to her credit each denoting a particular type of wealth. A yagna in Her name is equivalent to invoking the blessings of all eight aspects.